Sugar & Spice Children's Market: Mudpies & Mudcake. 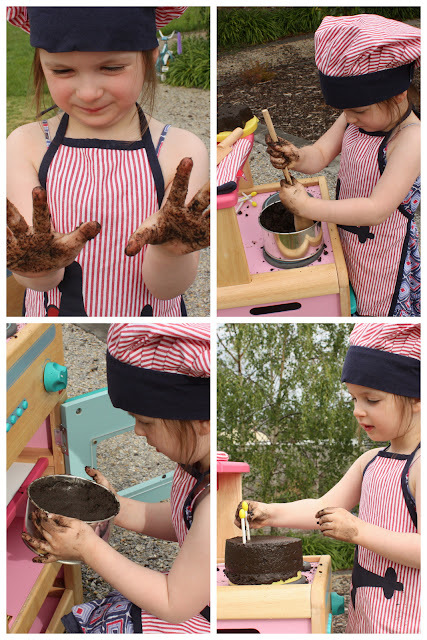 Our friends over at 1000 Homes of Happiness decided to make mudpies this weekend as part of the Playlist and I couldn't wait to join in the muddy fun, it has been a few (!) years since I've baked a mud pie. Miss Sugar however, was not convinced. "But I don't like pies Mum". Hmmm. So we changed the menu! 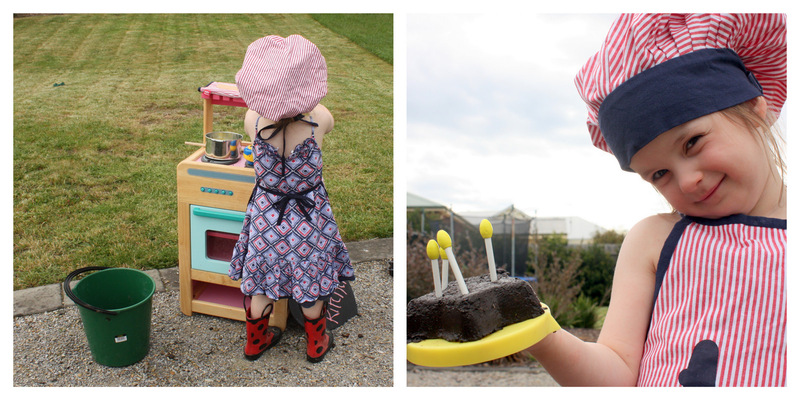 Cakes are definitely the way to Miss Sugar's heart, and we decided to bake Mudcakes instead. Off she went, hunting through my kitchen cupboards for cake tins and wooden spoons, and then raided her toybox for cake decorations and her chef hat... Mudcakes are serious business. Over 2 hours later she was still busy creating, squishing mud between her fingers and asking me what I thought the mud would taste like. She would only come inside for dinner when I promised that we could do it all over again tomorrow - of course we can, we have the main ingredient in our backyard! The thing I love most about the Playlist is that it shows how simple it can be to encourage outdoor play. STEP 2: Get bucket of mud! STEP 3: Have lots of fun! that is soooo cute, loving the chef's outfit!